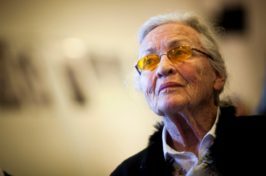 At the Raoul Wallenberg Foundation we received the sad news of the passing of Dr. Barbara Mooyaart-Doubleday. Barbara Mooyaart-Doubleday was a unique human being. Her memorable translation of Anne Frank’s diary into English played a pivotal role in bringing this poignant story to large audiences around the world. Her lectures and interviews were a source of inspiration to the young generations. Back in 2013 the Raoul Wallenberg Foundation bestowed upon Mrs. Mooyaart-Doubleday the Raoul Wallenberg Centennial Medal. She deserved the accolade and we are happy to have had the chance to thank her during her life-time. Dr. Mooyaart-Doubleday has lived a long, meaningful and productive life and she will be deeply missed. She made a difference. The hearts of all the members and staff of the Raoul Wallenberg Foundation go out to her dear family. 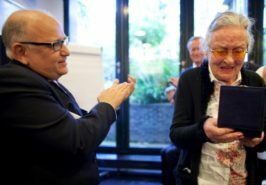 The International Raoul Wallenberg Foundation presented the Raoul Wallenberg Centennial Medal to Barbara Mooyaart-Doubleday, the original translator of Anne Frank’s diary into English. The ceremony took place on 28 October 2013 at the Anne Frank House, Prinsengracht 265, Amsterdam. The prize was bestowed in recognition of her lifetime dedication to keep alive the memory of the Shoah. A joint statement issued by Eduardo Eurnekian and Baruch Tenembaum, IRWF Chairman and Founder respectively, states that “Dr. Barbara Mooyaart-Doubleday is a living example of the power of positive education”. Ronald Leopold, Director General of Anne Frank House, delivered the welcome speech, while Ruben Vis, Secretary General of the NIK, the organization that covers more than thirty Jewish communities in the Netherlands, and Danny Rainer, IRWF Vicepresident, presented the medal to Barbara Moyaart. Brian Mooyaart, son of Mrs. Mooyaart, delivered the acceptance speech on behalf of his mother and Marie Dupuy, Raoul Wallenberg’s niece and Honorary member of the Wallenberg Foundation delivered the closing words. Chief Rabbi Binyomin Jacobs and diplomatic staff from the embassies of the United States, Sweden and Argentina were among the attendants. One of Mrs. Mooyaart grandchildren, Raoul Mooyaart, named after Raoul Wallenberg, also attended the ceremony. Dr. Mooyaart-Doubleday was born in the UK in 1919, daughter of Sir Leslie Doubleday and Nora Doubleday. After attending the prestigious Benenden School for girls, she was sent abroad to learn French. She is the mother of three sons. In 1946, she married a war pilot and moved to the Netherlands after he was discharged. She lived in Amsterdam from 1946 till 1949 before moving to Amersfoort, where she resides until this day.